In the Tribunal’s last outline statement, it was indicated that after dealing with a number of matters concerning the operation of the Leader’s Allowance Fund and one or two other topics, the Tribunal will be taking up with Mr. Haughey the evidence of the money trail to date. The inquiries to be taken up with Mr. Haughey concern not just the sum of approximately of £8.5 million mentioned at the outset of the last sittings, but also a number of other matters, once again in connection with the money trail, involving sums of money which were not included in the total sum of £8.5 million. Prior to taking up this matter with Mr. Haughey, the Tribunal will need to revisit once again the operation of the Party Leader’s Allowance account and the subject matter of the funds set up for the discharge of the medical expenses of the late Mr. Brian Lenihan. As a result of continuing inquiries instituted by the Tribunal in relation to these two related matters, certain new material has come to hand. The Tribunal will also wish to complement some of the evidence already given in relation to the operation of Feltrim Mining/Minmet, the company with which Mr. Conor Haughey, a connected person to Mr. Haughey, was associated. The Tribunal’s inquiry have also thrown up a further payment to Mr. Haughey from Mr. Bernard Dunne. This came to light in the course of inquiries instituted by the Tribunal with National Irish Bank. Firstly. I want to deal with further evidence arising out of inquiries instituted in connection with the operation of the Party Leader’s Allowance account and the funds set up for the discharge of the late Mr. Brian Lenihan’s medical expenses. In dealing with the Brian Lenihan fund at the commencement of its sittings on the 24th May last, the Tribunal examined new material which came mainly from two sources, namely Mr. Paul Kavanagh and Dr. Eamonn de Valera. Firstly, a document containing two lists of names of what appeared to have been potential contributors to the Brian Lenihan fund, together with what may have been an indication of some of the funds actually subscribed by individual contributors to the fund, was produced by Mr. Paul Kavanagh. The document did not contain the list of all those known to have been approached to make and who did, in fact, make contributions to the fund. The list did not include, for instance, the name of Dr. de Valera, through whom a payment of £10,000 was solicited from Irish Press plc. The Tribunal can find no record of the Irish Press plc £10,000 contribution in the Leader’s Allowance Fund to which contribution to the Brian Lenihan fund were supposed to have been lodged. Evidence was given that this £10,000 payment was routed through Coopers & Lybrand, now PriceWaterhouseCoopers, the then accountants and auditors to Irish Press plc. It is a matter of some concern to the Tribunal that, notwithstanding numerous inquiries to date, PriceWaterhouseCoopers have not been able to locate the cheque payment which came from that accountant’s client account, nor have PriceWaterhouse been able to locate any record of the payment having been made. The information provided by Mr. Paul Kavanagh led to a number of further inquiries by the Tribunal directed to individuals mentioned on both the typed and handwritten list compiled by Mr. Kavanagh. The Tribunal understands that inquiries have been put in train by Mr. John Magnier, Mr. Oliver Murphy and Mr. Gus Kearney in response to queries raised by the Tribunal concerning payments or potential payments that may have been made by or through them. As a result of queries raised by the Tribunal with Mr. Mark Kavanagh on the 29th May 2000, the Tribunal was informed that an approach was made to Mr. Mark Kavanagh by Mr. Paul Kavanagh in connection with the accumulation of a fund to discharge Mr. Brian Lenihan’s medical expenses in relation to his surgery in the United States in 1989. A contribution of £25,000 was made to the fund. The contribution was made by a cheque drawn on the account of Custom House Docks Development Company Limited at Allied Irish Banks, 5 College Street, Dublin 2. Mr. Mark Kavanagh believed that the cheque was made out to the Fianna Fail Party Leader’s Allowance account. The cheque was dated 6th May 1989 and was numbered 000334. The cheque was delivered by Mr. Mark Kavanagh to Mr. Haughey. Mr. Mark Kavanagh does not believe that he received any acknowledgment of this contribution. He was not informed of the identities of other persons who were approached to make a contribution to that fund. Following receipt of Mr. Mark Kavanagh’s response, the Tribunal was, on the 14th June 2000, provided with further information by Mr. Mark Kavanagh concerning all of the circumstances surrounding his dealings with Fianna Fail at the time of the 1989 election. Mr. Mark Kavanagh has informed the Tribunal that sometime in or around May 1989, he was contacted by Mr. Paul Kavanagh, a fundraiser for Fianna Fail, who indicated to him that the party had a substantial debt and that it was seeking to raise funds from a number of individuals and companies. Mr. Paul Kavanagh was looking for significant contributions and indicated something in the order of £100,000. He also requested a contribution for Mr. Brian Lenihan’s liver transplant and indicated a contribution in the order of £20,000 to £25,000. Mr. Mark Kavanagh felt that what was being sought was a substantial amount of money and that he would think over the matter, but that he would do what he could. Firstly, £25,000 payable to Fianna Fail by way of cheque. This cheque was intended for the Brian Lenihan liver transplant fund. Secondly, three drafts payable to cash, in the sum of £25,000 each, for the Fianna Fail party. The partners in the Custom House Docks Development Company Limited agreed to authorise the drawing of a cheque for £25,000 and a cheque for £75,000 payable to Allied Irish Banks. The cheque payable to Allied Irish Banks was to be used to purchase the three drafts in the sum of £25,000 each for cash. Mr. Mark Kavanagh has informed the Tribunal that he met Mr. Haughey on the morning of the election on the 15th June 1989 at 9:30am at Mr. Haughey’s Kinsealy home. His meeting with Mr. Haughey lasted about fifteen minutes and at the meeting, he handed Mr. Haughey an envelope containing the three drafts and the cheque which Mr. Haughey then opened. Mr. Haughey thanked Mr. Kavanagh for the contributions, indicating that they would be of great assistance to the party and that they were much appreciated and he then asked Mr. Kavanagh whether he wished to know how Mr. Haughey intended to use the different amounts, to which Mr. Kavanagh responded that he would. Mr. Haughey informed Mr. Kavanagh that the cheque for £25,000 would be lodged to the Brian Lenihan fund which he indicated was a Fianna Fail party responsibility and that two of the three drafts for £25,000, that is a total of £50,000, would go directly into the party’s central funds. He then asked whether Mr. Kavanagh would be happy if the final draft was used by him, Mr. Haughey, at his discretion to help with the election expenses of individual Fianna Fail candidates and Mr. Kavanagh agreed to this. Having obtained information from Mr. Kavanagh concerning the circumstances of the Custom House Docks Development Company payments to Fianna Fail, the Tribunal examined the Party Leader’s account in order to ascertain whether the sum of £25,000, by way of a cheque made out to Fianna Fail, was lodged to that account as part of the Brian Lenihan fund. As I propose to indicate in a moment, other inquiries instituted at a later point have shown that the cheque for £25,000 did not go to the Party Leader’s account. The Tribunal’s initial inquiries in any case showed that no lodgment of £25,000 was made to the account between the date of the delivery of the cheque to Mr. Haughey and the date of the debiting of the amount of the cheque from the Custom House Docks Development Company’s account at Allied Irish Banks. The Tribunal then instituted inquiries with the Fianna Fail party with a view to ascertaining whether the sum of either £75,000 or £50,000 was transmitted, as Mr. Haughey had indicated, to the Fianna Fail central funds. The Tribunal has obtained the assistance of Mr. Sean Fleming, who was then responsible for recording and receipting contributions to the party. Through Mr. Fleming and the Fianna Fail party solicitors, the Tribunal had, on an earlier occasion, been provided with a list of all contributions to Fianna Fail funds made at or around the time of the 1989 election. An examination of that list, Mr. Fleming’s master list, shows that no contribution from the Custom House Docks Development Company or from Mr. Mark Kavanagh in the sum of £50,000 or £75,000 or any amount was recorded. However, on the occasion of the Tribunal’s most recent inquiry to the Fianna Fail party, Mr. Fleming made available to the Tribunal a further document — this, we describe as Mr. Fleming’s second list — containing a list of individual contributors to the Fianna Fail party where receipts for the contribution made were not sent directly to the donors but were transmitted to Mr. Haughey or to his office. Some of the individuals listed in this way had made contributions on what appeared to have been an anonymous basis. Some of the contributions were identified. Mr. Mark Kavanagh’s name appeared on this separate or second list of contributors whose receipts were to be sent not to the contributors directly, but rather to Mr. Haughey. Mr. Fleming’s second list contained reference numbers which corresponded to reference numbers on his master list of contributors. The reference number opposite Mr. Kavanagh’s name was 4632. This corresponded to an entry in respect of an anonymous contribution on the master list in the sum of £25,000 for the 15th June 1989. Mr. Fleming has provided the Tribunal with other records kept by him of these particular contributions. His records contain a copy of the cheque representing the contribution recorded as having been made by Mr. Mark Kavanagh. This cheque was in the sum of £25,000 and was payable to Fianna Fail. It is, in fact, the cheque intended by the Customs House Docks Development Company Limited Partners for the Brian Lenihan fund. This is a photocopy of the cheque which was taken by Mr. Sean Fleming and has his writing on the bottom indicating the contributor as Mr. Mark Kavanagh and the number which indicates the number on his master list which records this contribution as being anonymous in the sum of £25,000. This information would have been conveyed to Mr. Sean Fleming by Mr. Haughey or Mr. Haughey’s office. The cheque is dated 13th June 1989 and it is two days before the meeting Mr. Mark Kavanagh had with Mr. Haughey at his home at Kinsealy on the 15th June 1989, the day of the election. As a result of further inquiries made by the Tribunal, the three drafts made out to cash which were taken by Mr. Mark Kavanagh to Mr. Haughey on the 15th June 1989, were traced to Guinness & Mahon bankers. Inquiries with Guinness & Mahon disclosed that the three drafts appear to have been presented at Guinness & Mahon in or around the 20th June 1989. Two of those drafts were used to purchase from Guinness & Mahon a further draft made payable to cash in the sum of £50,000. The remaining draft of £25,000 was lodged to an Amiens Securities account number 1218001. From that account, it was transferred to another Amiens account number 10407006, an Amiens account which featured in the evidence given at the Tribunal on numerous occasions previously. This sum of £25,000 was then withdrawn from the Amiens account in cash in two tranches as follows: £5,000 withdrawn in cash on the 29th June 1989. £20,000 withdrawn in cash on the 5th July 1989. This information again is information which would have been conveyed to Mr. Fleming from the Taoiseach or the Taoiseach’s office. The backing documentation supporting Mr. Fleming’s list included the instrument recorded as having been received in respect of this contribution. This was a draft issued by Guinness & Mahon bankers for £50,000 dated 19th June 1989 and made payable to cash. This draft was signed by two officials of Guinness & Mahon. Again, this is a photocopy of the draft which was taken by Mr. Fleming and retained by him at that time. The signature of one of the officials is indistinct. The other appears to be the signature of Mr. Padraig Collery. In response to inquiries from the Tribunal, Guinness & Mahon have confirmed from the identification number on this draft, that it was purchased using two of the £25,000 drafts given to Mr. Haughey on the 15th June 1989 by Mr. Mark Kavanagh at his home at Kinsealy. The Tribunal raised the matter with Mr. Smurfit and Mr. Smurfit informed the Tribunal that he believes that in 1989 a donation for Fianna Fail was solicited by the then Taoiseach, Mr. Charles J. Haughey. 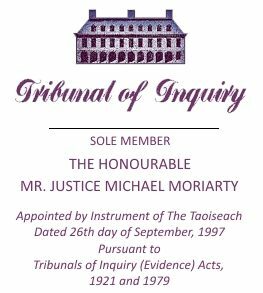 He also informed the Tribunal that the donation was made, that is the Smurfit donation was made, by way of a transfer of the sterling equivalent of IR £60,000 on the 14th June 1989 from the John Jefferson Smurfit Monegasque Foundation to an account at Henry Ansbacher & Company, 1 Mitre Square, London, EC3A 5AN. The account number to which the transfer was to be made was 190017/202. Mr. Smurfit informed the Tribunal that following the transfer, the John Jefferson Monegasque Foundation contacted the late Desmond Traynor to confirm that the funds had been received. The account to which these funds were transferred is, in fact, the account of Guinness Mahon Cayman Trust at Henry Ansbacher & Company Limited in London. It is the account through which very substantial sums of money appear to have been paid by Mr. Bernard Dunne and Mr. Dermot Desmond to or for the benefit of Mr. Charles Haughey. The Tribunal has not been able to locate the ultimate destination of these funds. It does not appear, on the basis of the information at present available to the Tribunal, that they were credited to any account at Guinness & Mahon in Dublin. Therefore, while the other payments which appear to have been made to or for the benefit of Mr. Haughey through this Ansbacher account in London were ultimately credited to an account under the control of Mr. Traynor in Dublin, and which appears to have been held for the benefit of Mr. Haughey, there is no record of the receipt of these funds into any such account. The Fianna Fail party does not have an Ansbacher account. The Tribunal believes that it would be justified in pursuing this matter with Mr. Haughey to see where the money trail ends and, in particular, to see whether offshore accounts other than those already identified may have been used to hold funds for Mr. Haughey. The Tribunal has instituted further inquiries with other individuals mentioned on Mr. Fleming’s second list and those inquiries are continuing at this moment. Additional information came to the attention of the Tribunal last Thursday concerning circumstances surrounding payments made by Mr. Mark Kavanagh. This information was in the form of a communication from solicitors acting for Fianna Fail who indicated that the party had been asked to comment on media reports that a senior Fianna Fail figure had informed the Taoiseach of inquiries raised by Mr. Mark Kavanagh in 1996 or 1997 concerning his contribution to the party in 1989 and the fact that he had not received a receipt for the same. Newspaper reports concerning the same matter identified Mr. Eoin Ryan as the senior Fianna Fail figure involved. Mr. Ryan promptly confirmed to the Tribunal that he was the individual concerned and that he has also provided the Tribunal with information concerning the circumstances of his dealings with Mr. Kavanagh. Mr. Ryan has informed the Tribunal that he joined the Fianna Fail fundraising committee in 1992 at the time that Mr. Reynolds took over as Taoiseach and leader of the Fianna Fail party. He has indicated that he knew Mr. Mark Kavanagh and that he was requested to approach Mr. Kavanagh in 1996 regarding a contribution to the party. Mr. Kavanagh indicated to Mr. Ryan that he was disposed to make a contribution but that he was somewhat annoyed that he had received no acknowledgment for an earlier contribution to the party. Mr. Ryan is not sure whether Mr. Kavanagh mentioned any specific sum but he understood Mr. Kavanagh to refer to a substantial contribution. Following his meeting with Mr. Kavanagh, Mr. Ryan brought the matter to the attention of the Taoiseach, Mr. Bertie Ahern. According to Mr. Ryan, Mr. Ahern said that he would look into the matter. He (Mr. Ryan), in fact, rang Mr. Kavanagh’s office and informed the office that the matter had been brought to Mr. Ahern’s attention and that Mr. Ahern was looking into it. The Tribunal has been informed that Mr. Ryan had no further dealings with Mr. Ahern in relation to the matter. He (Mr. Ryan), did not check the records of Fianna Fail to see what contribution had been made by Mr. Kavanagh in 1989 and it is only in recent days that Mr. Ryan has become aware of a suggestion that some of the contribution made by Mr. Kavanagh had not been received by Fianna Fail. While the Tribunal has only received this information within the last few days, it believes that it is so intimately connected with the dealings Mr. Kavanagh had with Mr. Haughey into 1989 that it should nevertheless be dealt with at these sittings. Further queries have therefore been raised with Mr. Sean Fleming and with the Taoiseach, Mr. Bertie Ahern, and it is hoped that they will be able to give evidence throwing light on this matter. The Tribunal has received a further statement from Mr. Sean Fleming who has informed the Tribunal that at some time in or around 1996, Mr. Bertie Ahern, who was then party leader, made an inquiry of him, Mr. Fleming, regarding a donation made by Mr. Mark Kavanagh in the June 1989 general election campaign. The purpose of such inquiry was to ascertain if Mr. Kavanagh had made a donation and whether the same had been receipted. Mr. Fleming has informed the Tribunal that from the records that were maintained at party head office, and which are still retained, and copies of which were submitted by Mr. Fleming to the Tribunal, he, Mr. Fleming, was very quickly in a position to confirm both of these facts. And he has informed the Tribunal that, as previously explained by him, the receipt, whilst marked “anonymous per an Taoiseach” at the specific direction of the then party leader, Mr. Charles Haughey, and which had been forwarded to his office at Government Buildings as per his specific directions, the source of such donations was still known to Mr. Fleming. Mr. Fleming does not recollect receiving any inquiry from Mr. Eoin Ryan, and that would seem to be in accordance with Mr. Ryan’s recollection of events also. The Taoiseach will be assisting the Tribunal in relation to his recollection in respect of these matters in due course during the week. The questions which arise concerning this matter are whether and if so, to what extent, other sums intended for Fianna Fail and transmitted through Mr. Charles Haughey may not have reached the party. Allied to this is the question of the extent to which queries concerning this matter may have been brought to the attention of other individuals in Fianna Fail. It now appears that of the various people mentioned in Mr. Fleming’s second list, contributions from two of them do not appear to have been received either at all or in the manner in which they were intended by the donors. Of Mr. Kavanagh’s £75,000 intended for Fianna Fail, only £25,000 reached the party. None of Mr. Smurfit’s money appears to have reached Fianna Fail. There is, of course, an overlap between the payments made by each of those donors in that £50,000 of Mr. Kavanagh’s money was used to pay for drafts which were transmitted to Fianna Fail purporting to constitute payments by Mr. Smurfit. And of course, it would appear that the £25,000 intended by Mr. Kavanagh to be for the Brian Lenihan fund did not reach that fund. There are still a number of inquiries outstanding in relation to individuals named on Mr. Paul Kavanagh’s list as potential or actual contributors to the Brian Lenihan fund. Apart from Mr. Mark Kavanagh, Mr. Nicholas Fitzpatrick will also be giving evidence in relation to a contribution from his company, Atron, one of those named on Mr. Paul Kavanagh’s list. Turning now to National Irish Bank, as a result of inquiries directed to National Irish Bank, the Tribunal has obtained the results of extensive searches put in train by that bank with a view to identifying the sources of lodgments to various accounts operated by Mr. Haughey. The bulk of the documentation resulting from National Irish Bank’s own inquiries did not become available to the Tribunal until last week. This was not as a result of any delay, I should hasten to add, on behalf of National Irish Banks. Their response was prompt, extensive and helpful. As Mr. Haughey, through his lawyers, has asked the Tribunal for more time to consider this material, the Tribunal does not propose, with one exception, to deal with it in this outline statement. The Tribunal has, however, brought one feature of the operation of the NIB account by Mr. Haughey to the special attention of his solicitors for comment by Mr. Haughey. No comment has as yet been received in relation to this matter. The matter is the lodgment of the sum of £20,000 being the proceeds of a cheque paid to cash drawn on a personal account of Mr. Bernard Dunne at Allied Irish Banks, O’Connell Street, Dublin. It’s on the overhead projector. The cheque was dated the 29th May 1993. It appears to have been lodged to the account of Charles Haughey t/a Abbeville Farm by Mrs. Maureen Haughey. It appears to have been endorsed on the reverse side by Mr. Haughey and also by Mrs. Maureen Haughey. Mr. Bernard Dunne has also been asked to comment on this document and he has informed the Tribunal that he does not have any recollection of the purpose for which the cheque was drawn but he says that it was at a time of high trauma for him, noting that some short time previously, he had been discharged from hospital with significant injuries resulting from an accident. Mr. Dunne has also informed the Tribunal that he assumes that he either handed the cheque directly to Mr. Haughey or that he handed it to a third party for forwarding to Mr. Haughey. Otherwise, he has no information or any other recollection of the circumstances in which the cheque came into the possession of Mrs. Haughey. This payment from Mr. Bernard Dunne, lodged to an account of Mr. Haughey, was never drawn to the attention of the Tribunal by Mr. Haughey, notwithstanding that the matter could have been drawn to the attention of the Tribunal in response to one of the Tribunal’s very earliest letters to Mr. Haughey. One of the questions which arises in the context of this additional information is whether the Tribunal can rely on the recollection of Mr. Bernard Dunne concerning the true extent of the payments made by him to or for the benefit of Mr. Haughey or other persons connected with Mr. Haughey. In the circumstances, it has now become necessary to institute a much wider range of inquiries with Mr. Dunne concerning the potential sources of payments from him to Mr. Haughey and Mr. Dunne is fully cooperating with the Tribunal in examining further material which might lead to evidence or to information which might lead to evidence relevant to the Tribunal’s Terms of Reference. The final matter I wish to deal with in this outline statement relates to Feltrim plc/Minmet. Evidence has already been given by Mr. Conor Haughey concerning the take up of shares in this company. Further inquiries have been instituted by the Tribunal concerning the circumstances in which Mr. Dermot Desmond subscribed £26,333 for shares in the company in July 1992. It appears from Mr. Conor Haughey’s evidence that these shares were not taken up in the course of the public placement by Feltrim in March 1992 but were only taken up at the request of Mr. Conor Haughey after a UK purchaser had defaulted in making payment for shares. It appears that Mr. Desmond, Mr. Emmet O’Connell of Eglinton Exploration and possibly Davys Stockbrokers, took up the excess shares and thereby averted the potential failure of the placement. The Tribunal will wish to inquire into the matters which prompted Mr. Desmond to take up the excess shares where he did not apparently invest in the company on the placement of shares four months earlier.